Count on genuine Fender American Standard Series Tuning Machines for tuning stability on your Fender guitar. With over 50 years in the business, Fender has thousands of accessories available. Whether you're looking for apparel, hardware, strings, cases, straps or more Fender has you covered! Do you want to change the look or feel of your Fender without spending a lot of money on a paint job? Try sprucing it up with a Fender American Standard Series Tuning Machines. 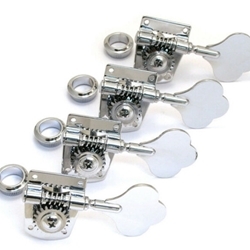 When you need replacement tuning keys for your Fender guitar, don't trust anything short of genuine Fender American Standard Series Tuning Machines.